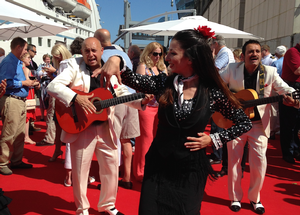 Windstar Cruises christened the first of three new yachts, the 212-guest Star Pride, on May 5 in Barcelona in a short pierside ceremony with a touch of Spanish flair under blue skies. The ceremony began with an “inaugural fiesta” as special guests, representatives from top travel agencies and consortiums, and loyal customers sipped flutes of sparkling wine and swayed to Spanish guitar players as dancers swirled in festive attire. After a traditional blessing by a local priest and a speech by CEO Hans Birkholz, Godmother Nancy Anschutz cut the ribbon that sent the champagne bottle smashing into the hull with a satisfying smash. She raised her arms in celebration as the crowd cheered. 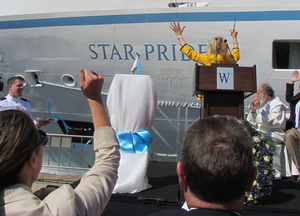 PHOTO: Godmother Nancy Anschutz, wife of Windstar owner Philip Anschutz, celebrates after the champagne hits the hull of the Star Pride. In his speech, Birkholz noted that it has been 16 years since Windstar welcomed a new cruise ship — the Wind Surf, which joined the fleet in 1998. 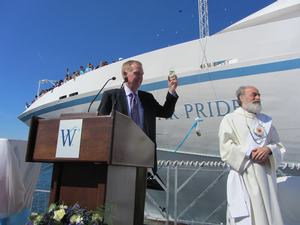 PHOTO: Windstar CEO Hans Birkholz raises a toast while crew members cheer from the deck above. The newly christened Star Pride joined the Windstar fleet on April 17 from Seabourn and immediately underwent a major renovation of major public spaces and all suites. “We tried to fit 36 hours of work into 24 hours for 18 days,” Birkholz said. The suites, many of which had French balconies installed a number of years ago by Seabourn, received new carpet, drapes, furnishings and headboards. 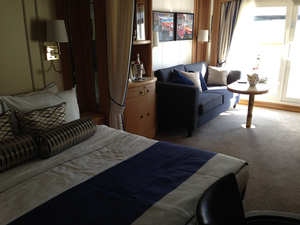 PHOTO: A roomy and freshly redecorated balcony suite on the Star Pride. The Star Pride is the first step in an expansion that will double the size of Windstar’s fleet. 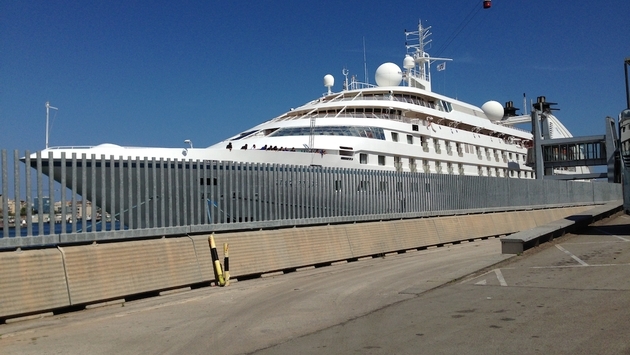 Windstar also purchased its two sister ships, which will join the fleet in May 2015 as the Star Legend and Star Breeze. Each is 10,000 gross tons with 106 suites and six passenger decks. 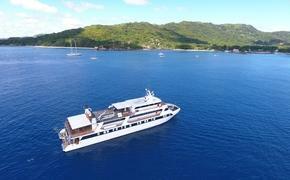 Windstar’s other vessels are motor-sail yachts that accommodate 148 to 310 guests. They are known for a stylish, nautical and casual ambience punctuated by huge white sails. Though the new vessels do not have sails — Windstar calls them “power yachts” — Birkholz says they will have a similar interior appearance, atmosphere and signature experiences such as a deck barbecue gala, open bridge experience and the sail-away party. Windstar now is part of Xanterra Parks & Resorts, which is owned by Denver-based billionaire Philip Anschutz, who also owns AEG and professional sports teams and venues such as the Staples Center in Los Angeles. 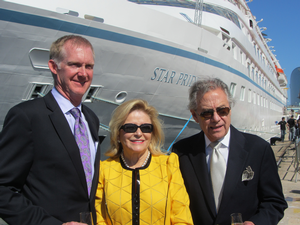 PHOTO: Windstar CEO Hans Birkholz, left, poses after the ceremony with Nancy and Philip Anschutz.